An Easy Ten Out Of Ten! As we approached Kiki’s for our impromptu lunch ‘somewhere new’, my best friend Kerri and I both commented on how cheerful it looked from the outside. 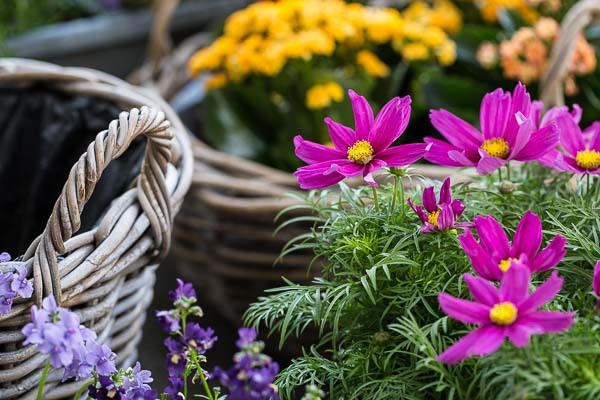 With bright sunshine yellow canopies hanging over the outside tables, and beautiful flowers littering the front entrance and doorway, you can’t help but smile and feel you spirit lift. Let’s just hope the food matches the first impressions I thought, as nothing lifts my spirits more than a tasty lunch. The moment I walked in, I instantly felt like I had been transported to an exotic island somewhere far, far away. There was soft ethnic music playing, bright colours everywhere and soft furnishings mixed with light wood and vibrant paintings and unusual trinkets dotted about the place. I loved it. It felt like somewhere you could really relax. Kiki’s is also somewhat unique. Not only is it a kitchen/bar but it is also a florist. Hence the flowers outside and in the entrance. They also sell a small selection of handmade cards, gifts and clothes. Floristry is one of the owner’s passions so she thought she would combine both the beautiful bouquets she creates with delicious food, inspired by her travels. 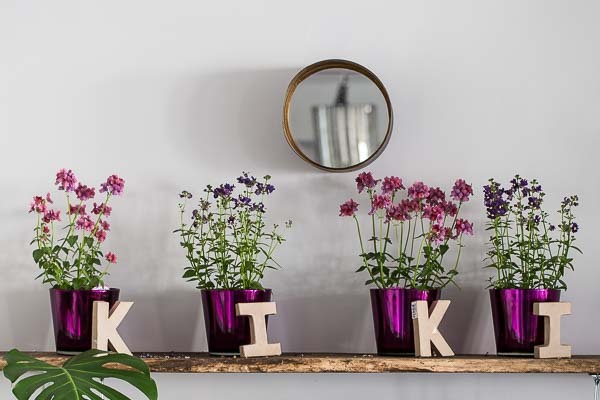 Having travelled extensively across countries like Spain, Morocco, Vietnam, Thailand and Peru, the food on offer at Kiki’s is heavily influenced by a range of exotic cuisines. To start we both decided on something fresh and healthy to drink: Kerri went for the fresh lime soda, and I went for the fresh mint tea (made with fresh mint, a squeeze of lemon and Manuka honey). Both were delicious and tasted so clean, preparing our palates for the variety of flavours to come. Feeling ravenous, neither of us could choose what we wanted as everything on the menu sounded so tempting. True to type, we didn’t hold back and ordered pretty much most of the menu with the intention of sharing so that we could each try as many dishes as we could. We went for two meat dishes, a fish dish, a salad and a couple of sides. 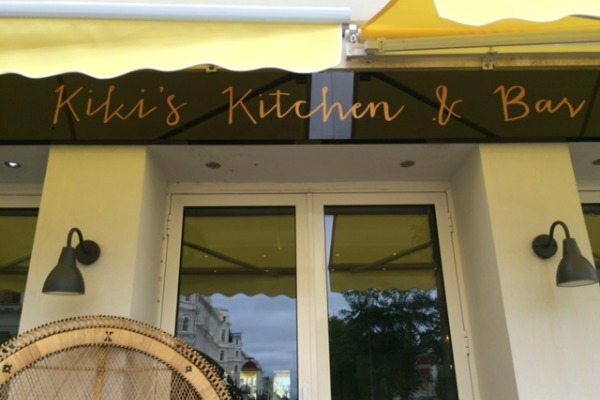 The dishes at Kiki’s aren’t ‘main courses’ as such so it felt a bit more like tapas. Though if I’m going to be truthful, I would say ‘generous’ tapas! A little bit embarrassing but just before our food came, we were brought another table to add to ours to make room! To add to the authenticity we were brought chopsticks as well as cutlery. Once we saw the food however, we both opted for the cutlery, simply because we didn’t want to be slowed down! 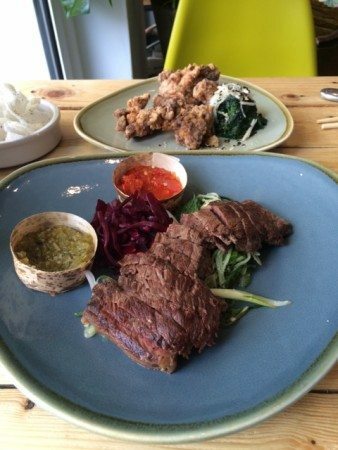 The Vietnamese Style Beef Salad was more ‘beef’ than salad which had no complaints from us. The seared sirloin was perfectly pink inside and sliced in perfect mouth-watering, bite-sized portions. Presented on a bed of cucumber, spring onion, fresh mint and coriander, lime juice and sliced chillies, it was honestly one of the best dishes I’ve ever tasted! Everything screamed freshness and authenticity. The chicken dish was Kara Age Japanese Style Fried Chicken. Again, just as mouth-watering as the beef. We discussed which one would be our favourite if we had to choose. Neither of us could. The chicken was ridiculously tender and tasted like it had been marinated in red wine before being fried. Served with a small mound of ‘gome ae’ – spinach with wasabi and parmesan cheese. Amazing. The fish dish was the ‘fish of the day’ – Pan Fried Cod with Chick Pea Salad. Presented beautifully with a creamy sauce and crushed pistachios. I could tell the fish was super fresh as it just fell apart. Kiki’s get their fish from local fishery Fish Galore, and the meat from a reputable nearby Butchers. All fruit and veg is brought from the market at Hollingbury. At this point, we were really enjoying ourselves. We both love variety and we both love homemade, fresh, fabulous tasting food. Similarly to tapas, our salad came out slightly after the first 3 dishes which we liked. The Mango and Avocado Salad was almost a main course in its own right it had so much character and ‘oomph’. And I very rarely say that about salads. 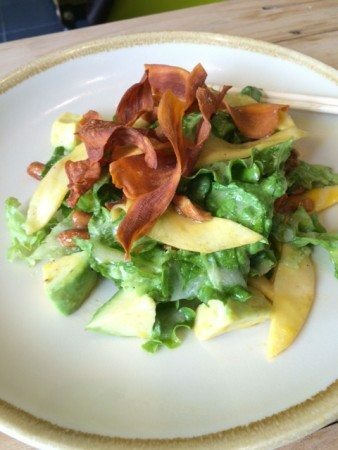 It was a large plate full of crispy green leaves, with generous chunks of creamy avocado, fresh thinly sliced mango and lots of crunchy, candied peanuts and sweet potato crisps. All drizzled with a homemade mango sauce. You wouldn’t think it would work, but oh my goodness, it certainly did. I’d probably go as far to say it was the best salad I’ve ever had. So fresh, so full of goodness but full of exciting flavours and textures also. Finally, just in case we didn’t have enough… we ordered a side of the Saffron Rice and the Vietnamese Glass Noodles. I personally didn’t look upon these with excitement but just thought it would help complement our ‘main’ dishes. I was so wrong. Both the rice and the noodles were so tasty, you could have eaten them on their own. There was surprisingly so much flavour in the noodles including some lovely chopped fresh chives. The rice was a beautiful turmeric colour, with herbs and spice mingled in and a slight stickiness about it. Lovely. As we came to the end of our beautiful meal, we both realised that we had barely spoken throughout. Considering we live in different parts of the country and don’t get to see each other much, that says a lot. One thing Kerri did say however, was that she had not enjoyed a meal so much since she used to live in Thailand. Despite how full and satisfied we were, we could not resist the offer of dessert. We were semi- restrained however and chose to share one. 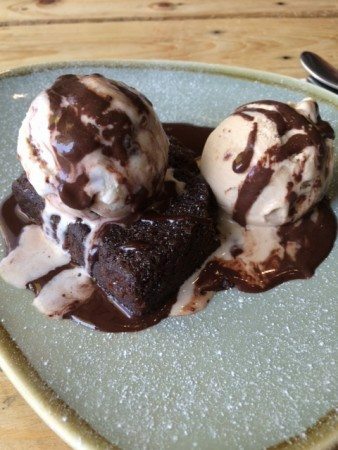 Homemade chocolate brownie with a choice of Brighton’s legendary Boho Gelato. I had heard of Boho’s but not actually tried it, so I was quite excited. We went for a scoop of the salted caramel (gluten and dairy free!) and the decadent hazelnut. As we both had our first bite, I knew we were both thinking the exact same thing. Why oh why did we share?! The brownie was warm, soft and gooey. As far as brownie points go, I’d give this one ten out of ten. In fact, the whole experience at Kiki’s was definitely a ten out of ten for the both of us. The food, the atmosphere and the service. It’s unique, colourful and full of character. You can even pick up a bunch of flowers, a unique piece of clothing or a nice gift for someone while you’re there! It’s clear the team care about freshness, quality and authenticity and really want to make their customers happy. And you wouldn’t only want to visit Kiki’s for lunch. 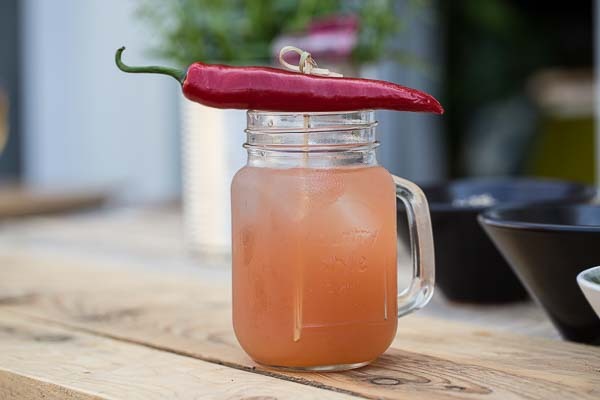 They do morning coffee and cake, breakfasts, express takeaway lunch deals and dinner, as well as some really interesting and exotic alcoholic beverages. A few hours later, my crazy but wonderful best friend Kerri kept saying how jealous she was of herself a few hours ago. Enough said.